Takeaway: If children are not succeeding in school, you are not trying hard enough. And that ‘you’ includes means, parents are not trying hard enough, teachers are not trying hard enough, administrators are not trying hard enough, kids are not trying hard enough. My wife is a teacher; I work part time with an after school program. My Mother-in-Law just retired as a principal in June and my Mom retired as a teacher last year. Many of my friends are related to education in one way or another. Personally, I spend a fair amount of time reading about and thinking about education theory and practice (at least for a non-educator). School reform is a hot topic, but the largest problem, in my mind, is scalability. There are many very good solutions to the problems of education, but very few of them really scale because they are so dependent on either the people or the cultural context where they are working. Ron Clark is a teacher and administrator that is trying to deal with the problem of scalability. He is the co-founder of a demonstration school in Atlanta. The school was built with the express purpose of teaching other teachers how to better reach students. (It is a middle school because that is the age that Ron Clark believes is most in need of help.) So each classroom has a class of about 30 student and stadium seating for about 80 adults. My wife and Mother-in-Law and many teachers I know have visited the school. I am currently trying to get some of the people that work in the after school program in Chicago to come down and visit. 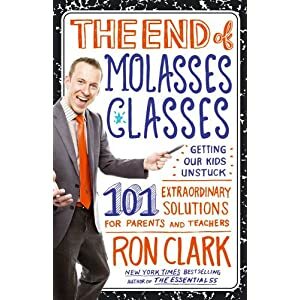 The End of Molasses Classes is the latest book by Ron Clark about his teaching method. I have read his two previous book and they were directed at teachers and more about how he teachers. This book is broader, for teachers and parents and other people interested in education. It more about the general method of how the Ron Clark Academy works and why it works. The format is 101 short chapters (some less than a page, very few more than 2 or 3 pages). Most chapters have a story to illustrate the point of the short chapter and a little explanation. Clark knows how to tell a story. He is a bigger than life, over the top, never can exert too much energy type of person. I went with my wife to the book release party and he never stopped. He signed about 1000 books, hugged and talked to every person, and did not stop moving all night. He is all about the energy, but there is more than just energy. He has well thought out principles that are behind the success of the school. One of the most obvious from the book is how much he values his staff, parents and students. He spends most of the book talking about how much the people around him have made the school a success. Clark is not a shy man, but he is also not hogging the credit. The major issue really is time and effort. Ron Clark Academy teachers work from before 8 to around 6 every day at school. Then most days they need to work at home to prepare for the next day or grade. Ron Clark and the co-founder told one another they would essentially ignore family and all other responsibilities for the first three years of the school to get it off the ground, and in the book he says that has not been long enough. I am editing this at about 6 AM. My wife is walking out the door to go to school. Yesterday she got home at about 6:30. We have said we will not have children because we cannot do our jobs and have kids. Obviously that is not going to work for all teachers. And it cannot really be expected for all teachers. Not every teacher is going to teach like Ron Clark, he knows that. But he does hope that teachers realize that they are important to the process and that it is essential that teachers find the best way to engage their students. This is not a blame book, but he is clear that teachers and schools can only do so much. Without parent support, even the best teachers will often not be able to help students succeed to their full potential. I am seriously considering going to visit the school myself because I want to know more about it. If you have any interest in education, or you are a parent, this is a good book about what needs to be done to move students to the next level. If you are a teacher, get this and read it before school starts, you will be encouraged and ready to start the year. I haven’t read this book but as an educator I am aware of Ron Clark’s methods. I agree that the biggest problem is that not all teachers, administrators, parents, and students are like Ron Clark. And, it isn’t just the fact that most of us don’t have the motivation or ability to give up our personal lives to become what we need for success in schools. I feel that it is that we don’t have the same personality and energy as Ron Clark. I have also seen him speak and I was blown away by how much energy he has. It is a little overwhelming to think that even on my most rested days I would never be close to that because it simply isn’t part of my personality. Does that mean that I will not be a success as a teacher? I don’t know. I think that we would be hard-pressed to fill schools all over the nation with teachers and administrators that can teach and act like Ron Clark. I would be interested in a book that explains how to be successful and make up for the fact that we are not all superstars like Ron Clark. I think energy is important to him, but engagement is more important. He is pushing kids in a particular direction. I wanted to ask him if any of his kids were introverts. But I knew his answer would be yes, but we still have to train them to be engaged with people. He is a good example of why school reform has a problem. He is not replicable. But he is suggesting that teachers can do more (and find the style that works for them). But he also is clear that teachers cannot do everything. If parents are not involved and kids won’t work, there is only so much a teacher can do.